This tome is the second volume of Holman Hamilton's landmark biography of Zachary Taylor (1784-1850), the 12th President of the United States. It examines Taylor's brief but important political career and traces Taylor's life from his return to the U.S. in December of 1847 from the bloody Mexican battlefields, to his death on July 9, 1850, a mere sixteen months after assuming the office of the pre… sidency.As interesting as the history surrounding Zachary Taylor's life is the man himself. Taylor was no politician. Throughout his life, he never voted in an election. He knew little of the party that nominated him. And he candidly admitted no opinion on certain political questions, and on others was reluctant to comment at all. At the end of his famous Allison letter that secured him the presidency in 1848, he stated: "e;I do not know that I again shall ever write upon the subject of national politics. 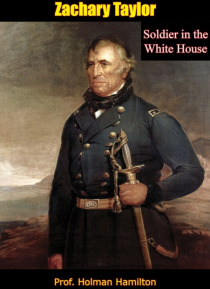 "e; How and why he was elected President are just some of the questions that Hamilton answers about one of America's most unusual presidencies.Zachary Taylor: Soldier in the White House is the sequel to Zachary Taylor Soldier of the Republic. Together, both volumes represent what is considered by historians to be the definitive biography of the 12th President of the U.S. Lauded for his meticulous research and highly readable style, the late Holman Hamilton, a noted journalist and editor, set out to "e;write entertainingly and even artistically about men and events in the realm of actuality. "e; Both volumes of this extraordinary biography are ample proof that he accomplished his goal.